DFA Night at Tool Shed is on hiatus for re-tooling. Look for an exciting, all-new experience in Spring, 2015! Here’s more great news and another bi-monthly event you can look forward to: The Tool Shed has agreed to host us for DFA Night every second and fourth Friday of the month! These are the same nights as our Discussion Group sessions, so the plan is to head over to the bar for social time after the conversation wraps up. Brothers who can’t make it to the group—or those who just prefer to socialize—can meet us at the bar at 9 pm! 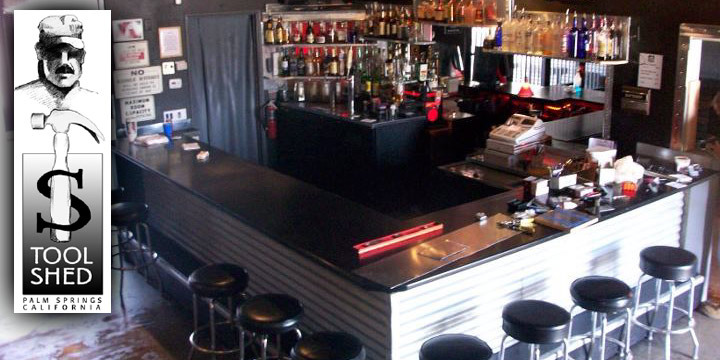 For those who don’t know, the Tool Shed is “Palm Springs’ Friendliest Leather and Levi Cruise Bar,” so it’s a perfect place for us to gear up and hang out. If you’re new to the fetish scene or just want to make new friends, there’s no better place to visit—and no more welcoming night to do so—than DFA Night! DFA Night at the Tool Shed will launch the same day as our Discussion Group: Friday, January 11. The Tool Shed is located at 600 E Sunny Dunes Road in Palm Springs. See you there!